General Motors is one of the companies that is experimenting in the world of self-driving technology. One of their Cruise units has recently been pulled over and ticketed for driving too close to a pedestrian, just one week following a fatal self-driving Uber car crash in Tempe, Arizona. Cruise disputes this officer’s accusation, denying any unsafe behavior by the car. They also state that they have data to prove the vehicle was actually 10.8 feet away from the pedestrian. Any behavioral reporting of self-driving vehicles is relatively scarce, partly due to the technology being so new on the streets. Cruise, along with other companies nationwide are not required to report the number of citations their units receive. Reporting is actually non-existent outside of California. For example, in Arizona, a self-driving Uber car struck and killed a pedestrian. However, self-driving car companies are still not required to file reports on any crashes or self-driving disengagements. California, on the other hand, requires these companies to report every time one of it’s vehicles is involved in a car accident, and they’re also required to file annual reports including a list of how often the human driver behind the wheel of one of their self-driving vehicles takes control of the wheel for safety related reasons. While no one was injured in this matter, the operator of the Cruise unit is now responsible for taking care of the ticket. Should the driver have sole responsibility for the citation? Does the manufacturer or owner of the car hold any responsibility? 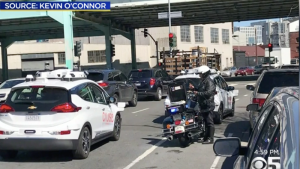 As we continue to venture further into the future of self-driving cars, we’ll have to determine exactly who is at fault upon traffic stops and accidents.